There's nothing better than an Aussie Christmas - Everyone out on the lawn for a game of back yard cricket after lunch while the flamin' galah watches from the Hills Hoist! 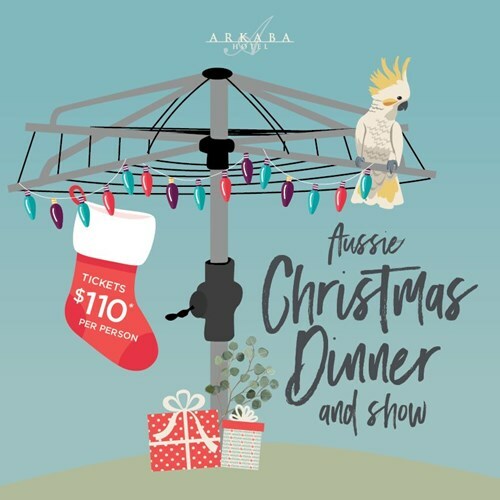 Come and party at our Aussie Christmas Dinner & Show - and don't worry, Dad won't be there burning the chops on the barbie. Hosted by Aussie comedian Mike Klimczak. Terms & Conditions All bookings are subject to a booking fee per person. Online Bookings - When booking online, full payment is required at time of booking. Guests can pay separately online but must put a “table captain” name when booking to ensure they are on the correct table. All payments are strictly non-refundable. In the instance of a reduction in numbers, any payments already made will be forfeited. All guests requiring special dietary needs must contact reception at least one week prior to the event. Undisclosed dietary requirements may incur additional charges.